After last week’s full on schedule this week by contrast was a quiet one. 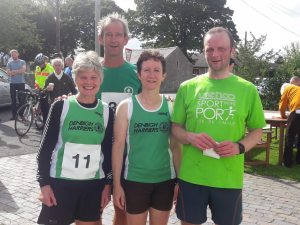 Saturday dawned bright and early with the annual King John’s Castle Fell Race with stalwarts of this course husband and wife Victoria & Jon Whitehead and Menai Baugh joined on the start line by newcomer Mat Jones. A perfect day on the fells – weather started out chilly but the sun soon came out…conditions underfoot were good with a relatively modest field of 36. Post-race chips in The Raven along with the race, of course, are the highlights of the day. Mat led the Harriers home in 50:15 winning his VM50 category – though the race organisers would like to see his birth certificate next time! Next in were Victoria in 53:04 and Jon with a PB of 58:55. Menai couldn’t resist trundling slowly around – it’s a race she loves. Unfortunately she got lost!! Again!! And after last week’s ultra in the Alps, probably shouldn’t have run but enjoyed more of a walk than a run this time around. No matter she still won her VF60 category. Sunday morning saw the Guilden Sutton 10k and the promise of a fast 10k course. PB and UK rankings seeking on the agenda, along with comebacks and training runs. The race was billed as 2 undulating laps followed by a fast flat downhill section. What everyone failed to register (even those who’d run it before) that after that glorious downhill, there is a rather long steady climb to the finish. Phil Hayes was first Harrier home, 47th and running a PB in 42:04 though disappointed not to get under 42 mins. Phil, having run this course before, blames that last climb. This will be a theme. You will break 42 minutes Phil – you have the ability! Next home and running together were Vic Belshaw and Emma Collins. Vic returning from a chest infection was having a training run whilst Emma took her category by 8 minutes from her nearest rival – 77th 44:52 & 78th 44:53 respectively. Making up the quintet were Chris Baldwin chasing the VM60 UK rankings which require VM60 runners complete a 10k in under 49:30. Chris, in his last year as a VM60, was just outside the cut-off in 49:34, that last climb featuring again in the post-race analysis. Dawn Marshall was last home, chasing under 1 hour as she returns from injury, was delighted to hold her target race pace for the majority of the race (yup! That final climb again!) to finish in 58:15. And so to parkrun, reflecting the quiet week, the Harriers were quiet at parkrun attending only our two local races. Nice to see Sarah Bayliss putting in another strong run at Conwy in 16th lady and 25:57 and great to see Andy Morris stretching his legs in 30:44. Slightly closer to home was Vic Belshaw, in spite of the tail end of his recent illness, put in a PB taking 6th in 20:33 at Bodelwyddan Castle with Elen Baugh just short of her best in 26:17 as 3rd Lady. This entry was posted in 10k, Fell running, Parkrun, Weekly report. Bookmark the permalink.